Most people would think mulching a tree to be the most natural thing in the world. Mulch recreates the forest environment where decaying twigs, leaves and branches cover the ground. As nature breaks them down, they feed the trees and keep the soil moist. the base of their trees. (I have to admit, I'm guilty of this as well) Huge wood-chip piles are smothering these poor, helpless trees. These mounds look unnatural and actually damage trees by depriving them of water and air. In this article, I will explain the basic steps for mulching a tree. You can use whatever mulch you wish - compost, shredded leaves and bark are all acceptable. If you wish to use wood-chips, they have to be fully composted or they will deprive soil nitrogen as they decompose. This will cause your tree to starve. One plus to mulching correctly is that you will fertilize water and weed less frequently. The mulch will provide all the nutrients that your tree will need. When you mulch a tree, keep the mulch 6 to 12 inches away from the trunk. 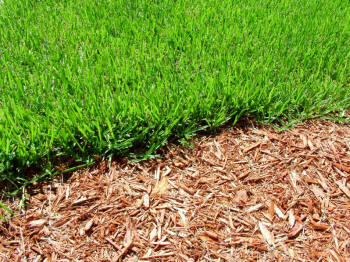 Mulch holds moisture, which is a plus unless it is piled against the tree's trunk. Unlike the roots of trees, the trunk will not tolerate being constantly moist. By putting mulch around the trunk, you are sending an invitation to moisture-loving insects, rodents and fungi. Mulch should be applied to ensure that when it settles the layer will be no more than 2 to 3 inches deep. If mulch has a fine, sawdust texture or is applied too deeply, water and air will not be able to penetrate the mulch layer. Be sure to spread mulch over the ground directly under the tree's canopy. This area is known as the drip line. This keeps grasses from growing near the tree's roots. It prevents injury to the tree's trunk by your lawn mower or string trimmer. It allows more of the tree's root system to benefit from the moisture-retaining mulch. By following the above tips, you will save time water and fertilizing and will enjoy a yard with healthy, beautiful trees.